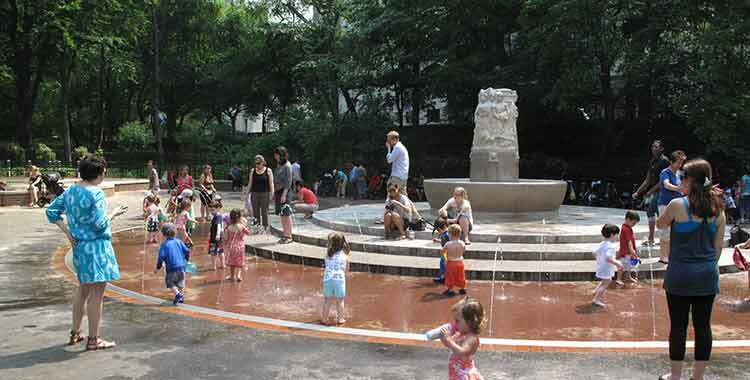 In the center of this playground at East 76th Street is a whimsical water spray fountain featuring characters from Alice in Wonderland. Originally the Sophie Loeb Drinking Fountain that stood between the Heckscher Playground and Heckscher Ballfields, it was moved to the present location to better serve children as a water play feature. The sculptor was Frederick George Richard Roth, the artist who also did the carving and scultures at the Zoo, Mother Goose, and Balto. Play features include colorful pipe frame equipment and bucket swings geared toward toddlers.